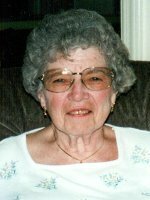 McKOWNVILLE – Veronica J. Dugan, 90, of McKownville, died Wednesday, January 18, 2012, at the Teresian House in Albany after a long illness. Born in Albany on October 24, 1921, Ronnie was the daughter of the late John J. Whalen Sr. and Bertha Riley Whalen. She was a graduate of Cathedral Academy, served proudly as a member of the U.S. Navy WAVES in World War II and was a communicant of Holy Cross Church/All Saints Catholic Church in Albany. In 1950 she married J. Leo Dugan Jr. who she met through the Catholic War Veterans organization. After World War II Ronnie was employed by the Internal Revenue Service until her first child was born. She was a dedicated mother who was involved in her children’s activities, active in school functions at St. Margaret Mary School, and a Girl Scout leader. She was long time member of the McKownville Fire Department Auxiliary serving in various officer capacities and was a past member of the Catholic War Veterans and the VFW. She volunteered for many organizations most notably the American Cancer Society and eventually was employed by them. Ronnie also volunteered for many years at the Teresian House where she later lived out her final years. Ronnie is survived by her devoted children, Patricia (Daniel) Olson of Lyons NY, Mary V. Dugan of Tuckahoe NY, J. Michael Dugan of Stuyvesant NY and Cathleen (Dave Brown) Dugan of Ray Brook, NY; her brother and his wife, John J. and Helen Whalen of Vestal, NY. She is also survived by her grandchildren Mary Olson, Laura (Nick) Botkins, Erik Olson, Heather, Jennifer, and Stephanie Dugan and Kyle Golden and great grandchildren Connor Andrews and Emma Dugan. She was predeceased by her husband J. Leo Dugan Jr. in 1999, her parents, and her sisters Sister Annunciata (Mary) Whalen CSJ and Eleanor (John) Whalen Connolly. Funeral services will be held in the Infant of Prague Chapel at the Teresian House, 200 Washington Ave. Ext., Albany Saturday morning at 11:00. Relatives and friends are invited, and may call at the Hans Funeral Home, 1088 Western Ave., Albany on Friday from 4-7 pm, or at the Teresian House from 10-11 am Saturday. The family is very grateful for the kind and loving care given by the staff of Carmel Garden West at the Teresian House. Memorial contributions may be made in her name to the Sisters of St. Joseph Provincial House, 385 Watervliet-Shaker Road, Latham, NY 12110 or to the Teresian House, 200 Washington Ave. Ext., Albany, NY 12203. To leave a message of condolence for the family, send a sympathy card, or obtain directions to the funeral home, please visit www.HansFuneralHome.com. So very sorry about the loss of your mom. May you all be comforted by the happy memories and the belief she now rests peacefully with her soul mate! She will continue to smile down upon all of you. I am so sorry to hear of the passing of your mother. That is a wonderful picture of her – such a wonderful smile. It brings back many memories of being at your house.